It's a good day's drive from Tucson to the red rocks regions of Northern Arizona and Southern Utah, but every time I consider complaining about the drive, I remind myself that a good day's drive from Miami got us to Pensacola or Savannah and that required never leaving the Interstate. Every night for the ten years we lived in Miami, I took Kodiak out for a walk and looked up at a sky with no stars. I always knew that I would never again live in a place without stars. My photography days begin in the early evening and end shortly after sunrise. The warm evening and morning light, the long soft shadows and the reflected light of the night define my images. Even before leaving Florida, I'd been the designer and editor of SPAN, the quarterly magazine of the Natural Arch and Bridge Society (NABS, http://www.naturalarches.org). Up until early May, I had only met one other member of NABS, David Brandt-Erichsen, the Society's Webmaster and a former editor and publisher of SPAN, as we both live in Tucson. He is one of the outstanding people, along with David Kennedy, also a former editor, who help me edit SPAN. 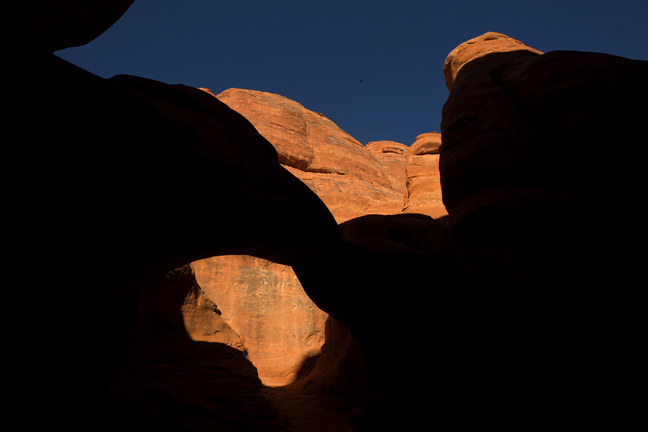 Both have seen, climbed to and documented many more arches than I will ever see or photograph during my lifetime. Every year, NABS holds two rallies for their members. 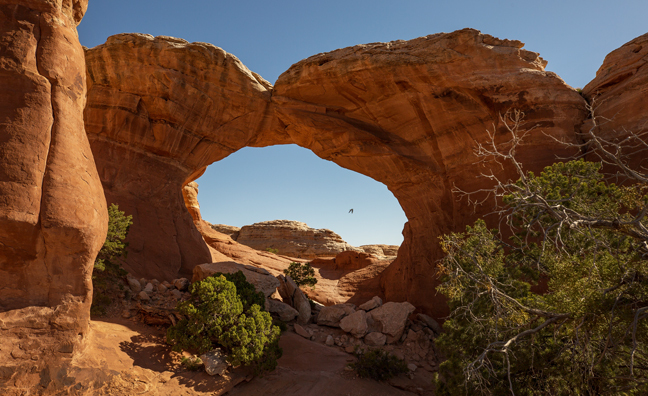 A rally consists of eight days of hiking to see natural arches and bridges within a selected region, usually in the Southwest. The rallies are in early May and October, so were never feasible with my previous academic schedule. 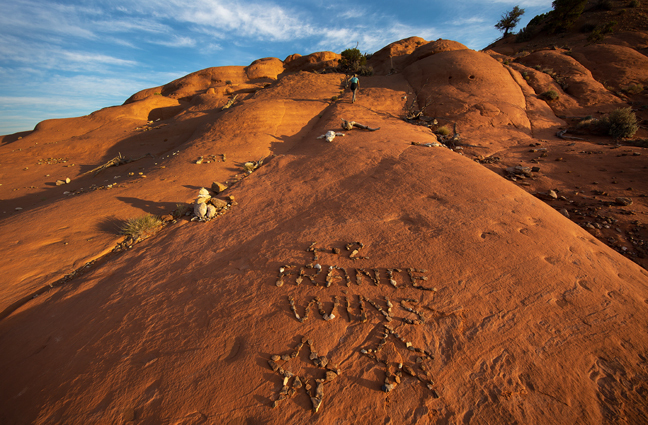 The Spring 2018 Rally was in Moab, Utah: gateway to Arches and Canyonlands National Parks. Many of the hikes were outside of the National Parks and required high clearance four-wheel drive vehicles to reach the trailheads. These folks are serious about their vehicles and their arches and can hike and scramble with anyone. Within the group are mountaineers who summited Everest, Denali, Chimborazo and Kilimanjaro; Vietnam War veterans, a former Marine, a retired physics and astronomy professor, the creator of the World Arch Database and accomplished artisans, all of whom know every rock on "roads" that I never even knew existed. The day before the rally Cynny and I spent the afternoon hiking to Druid Arch in Canyonlands National Park, a 10.4 mile out-and-back hike with 1,633 feet of elevation gain, assuming you don't miss any turns (we did). 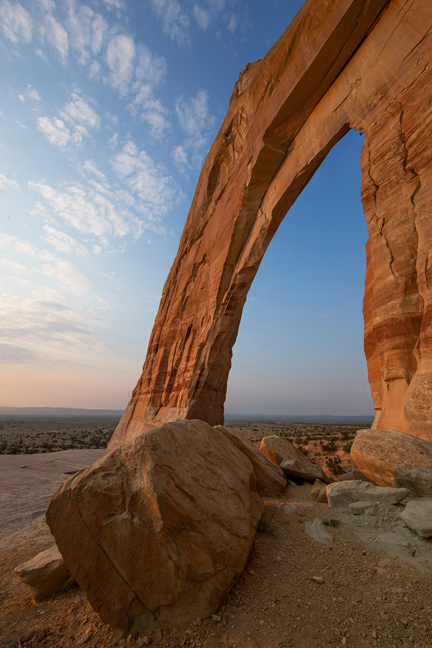 The arch is at the mid-point and requires a good amount of rock scrambling to reach. It's a beautiful, even iconic arch, but it would have photographed better in morning light. I guess we'll have to do it again. 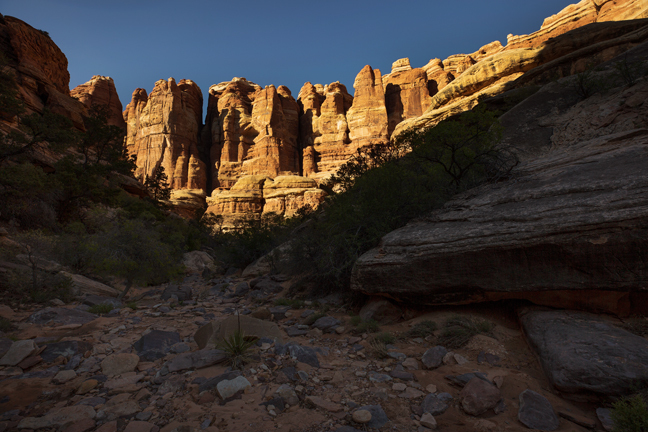 One thing you realize quickly when you live in the Southwest is that there is rarely a paved road to where you want to go, but that there are ways to get almost anywhere. 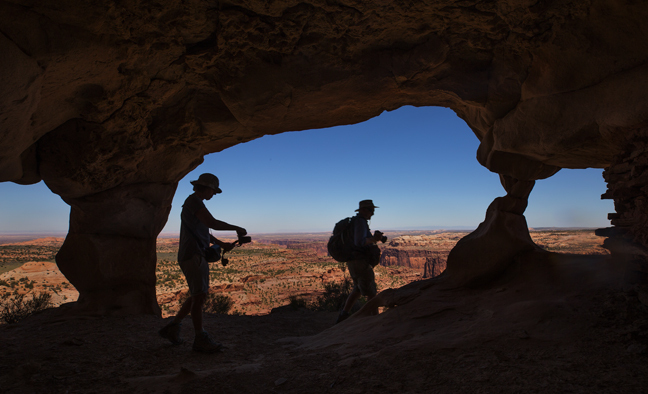 The Shafer Trail, Hole-in-the-Rock Road, Behind the Rocks Road, Toroweap Overlook Road, House Rock Road and hundreds of others are all unpaved and often ungraded gateways to paradise. I don't yet own a high-clearance four-wheel drive vehicle and I'm still learning how to drive these roads. I can't keep up with world-class mountaineers on the trail, I don’t have access to Native Lands and I'm an amateur at navigating with my GPS and topographical maps. However, because of the kindness of NABS members, I'm slowly learning these essential skills and many of the photographs in these two slide shows (Red Rocks I and II) would not have been possible without these wonderful folks helping me, so thanks to Henry, Pat, Tom, David B-E, David K, David A. and so many others. Upon moving to the desert, we were told that July was the month that most residents headed elsewhere, as the temperatures would average close to 110 degrees and the monsoon season would begin. So on July 13, we headed north for a three-week road trip to the Canadian Rockies. Our first stop was a night in Sedona to check out Fay Canyon Arch under the night sky. As luck would have it, clouds blanketed the sky and we settled for a quiet evening indoors. We headed next to the North Rim of the Grand Canyon for a second cloudy night before leaving Arizona for Utah with the goal of photographing Grosvenor Arch. 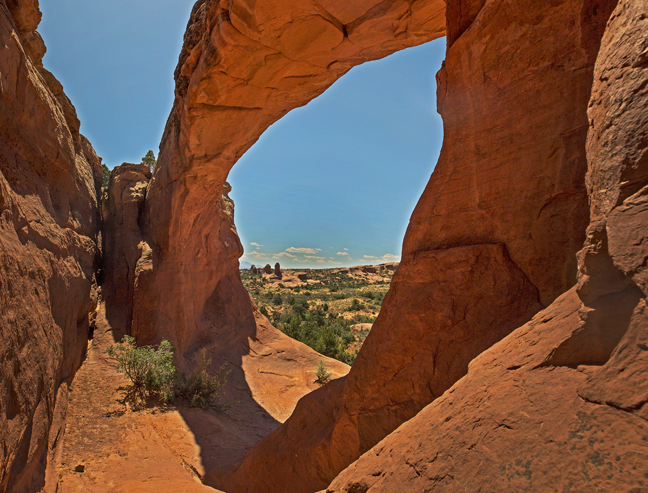 The arch is about ten miles from the entrance to Kodachrome Basin State Park off of Cottonwood Canyon Road, a graded dirt road that is easily navigated in dry weather. Unfortunately, after three days of rain, we had to turn back after the first mile. The clouds remained, but the rain had stopped, so we spent the afternoon in the Park hiking to Shakespeare Arch (12S 413196 4151500, 18 feet x 12 feet). 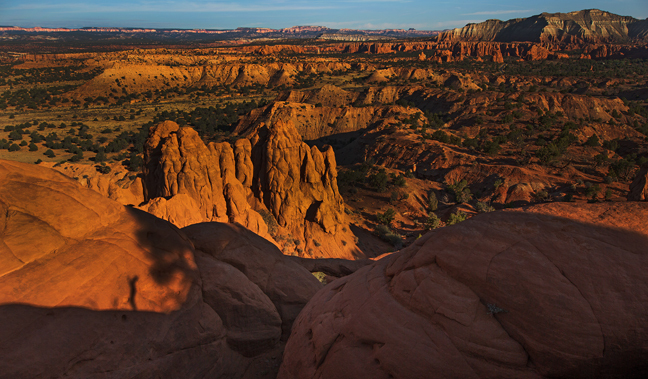 Kodachrome Basin State Park features 67 monolithic stone spires, known as sedimentary pipes. It was originally named Kodachrome Flats after the popular slide film following a National Geographic Society expedition in 1948. 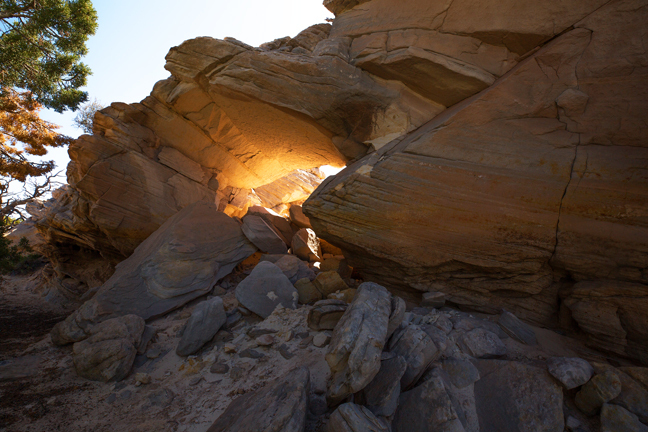 In 1962, the area was designated as a state park and renamed Chimney Rock State Park. 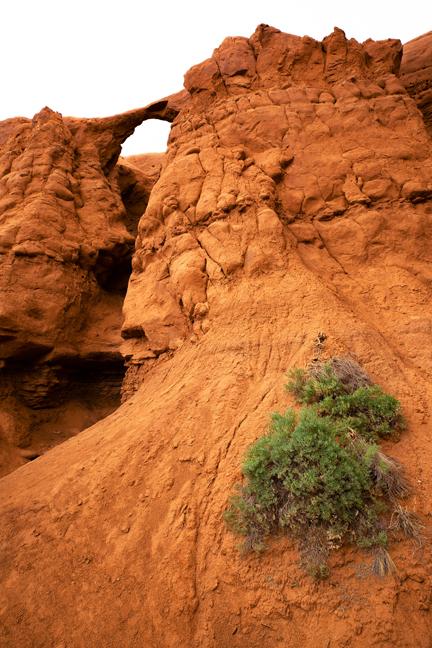 It was renamed Kodachrome Basin a few years later after Kodak granted permission to use the name. 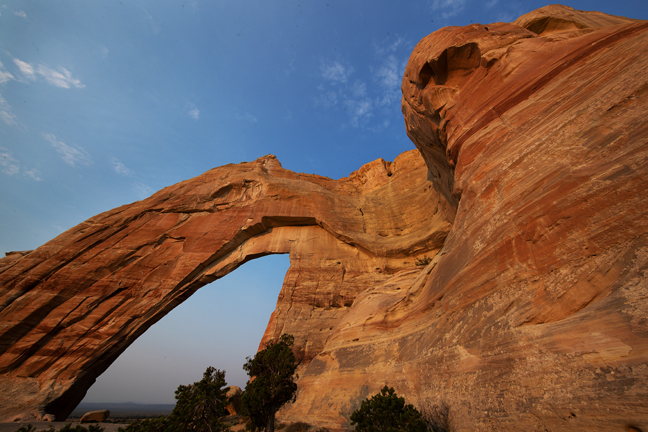 The sky cleared overnight and we decided to climb above Shakespeare Arch to watch the sunrise over the Escalante. On the way up, I stopped to read the latest sports news as Cynny continued on. France had beaten Croatia 4-2 to win the 2018 FIFA World Cup the day before. The Sentinel is one of the 67 sedimentary pipes in the Park. There are various geological theories that attempt to explain the formation of these pipes, but they are unique to the region, not known to exist anywhere else on earth. Above Shakespeare Arch at sunrise overlooking the Grand Staircase Escalante National Monument. 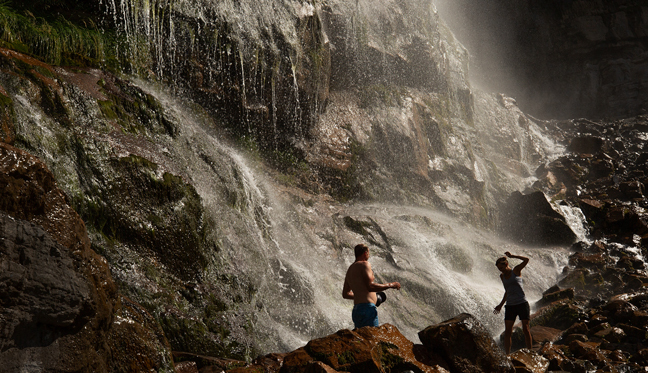 Bridal Veil Falls is a 607-foot double cataract waterfall at the south end of Provo Canyon. Prior to a 1996 New Year's Day avalanche, a six-passenger tramway carried passengers to the Eagle's Nest Lodge and restaurant built in 1961 on a cliff at the top of the Falls. The owners claimed that it was the "world's steepest aerial tramway." There are numerous ponds at the base of Bridal Veil Falls. Here, a young couple kisses on the rocks. 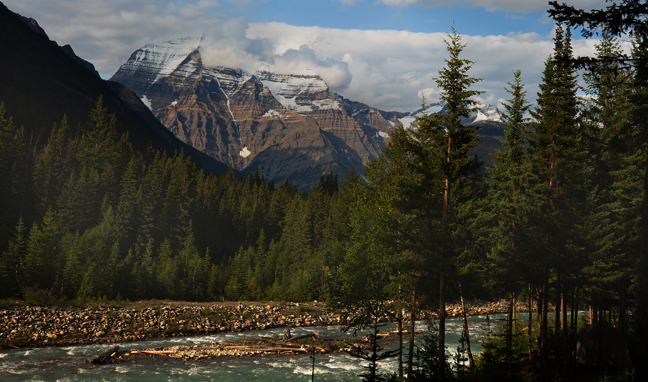 After overnight stops in Butte, MT and Calgary, Alberta, we settled into our cabin along the Fraser River under the shadow of Mount Robson, the highest point in the Canadian Rockies and our base for exploring Mount Robson Provincial Park. Once agin, the weather was less than ideal. There were days when the mountain was not visible, days of steady rain and a few days of broken clouds and occasional sun. We managed a few hikes along Berg Lake Trail, but outdoor activities were severely limited and things were about to get worse. We had already shortened our itinerary because we were concerned about our elderly dog who isn't able to travel anymore. After an extensive process, we had found someone we thought was a suitable caregiver. Unfortunately, she was not and we had to call a friend to rescue him. Finally, we decided that we needed to cancel the rest of our itinerary. I drove Cynny to Missoula where she caught a flight home to care for Kodi and I drove the final 1,300 miles home. After a cloudy spring and early summer Milky Way season, NABS members Patrick Moore, Henry Wede and I were determined to capture the Milky Way through the iconic White Mesa Arch located at the eastern edge of the mesa within the Navajo Nation. 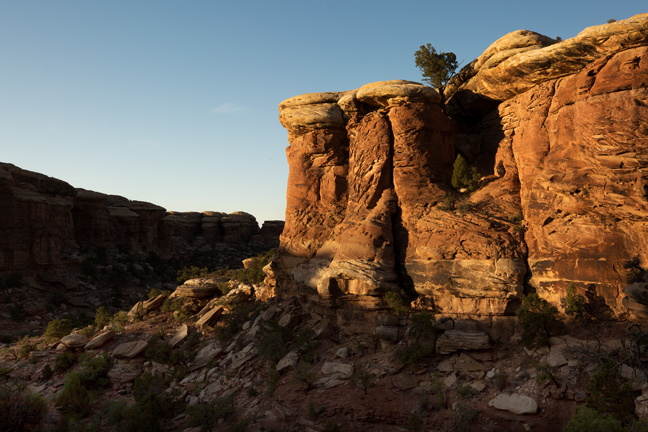 The Navajo Nation includes parts of Utah, New Mexico and Arizona and covers more than 27,000 square miles. If it were a state it would be the 41st largest state in the country, larger than Maryland, Vermont and New Hampshire combined. 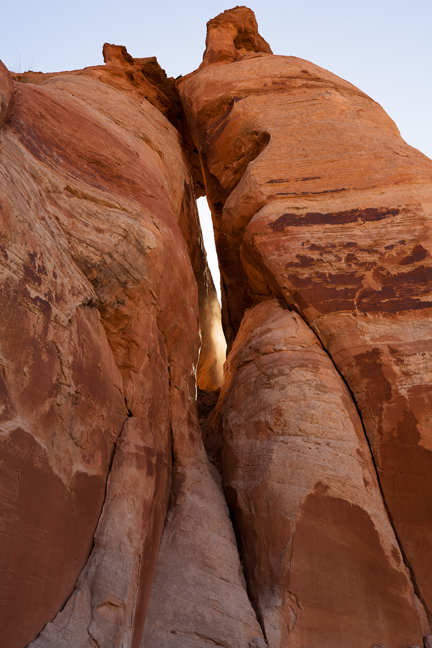 Access is restricted to persons of Navajo lineage and permit holders, but after years of dedicated service, Pat was adopted into a Navajo family and has many friends who could accompany us to the arch. Between low clouds and smoke from numerous CA and local wildfires, we were less than optimistic and due to a variety of circumstances we arrived at the remote parking area long after dark. Ideally, I arrive on location well before dark to scout an area and set up my shots. 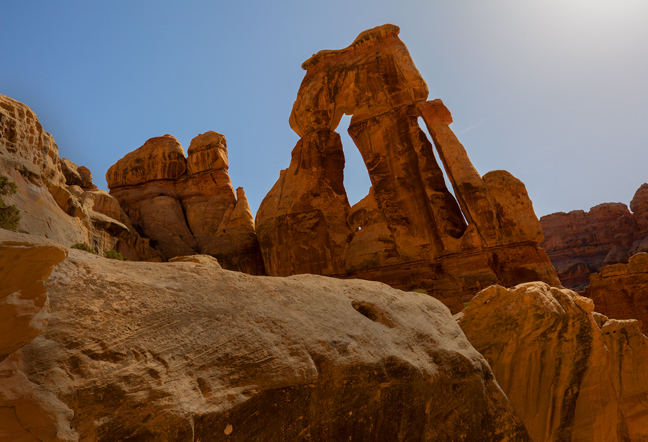 Since I had never been to the arch before, I had no idea what equipment I would need to light or photograph the arch. Fortunately, Henry immediately volunteered to help with gear and off we went. I won’t say that we took the easiest or most direct path to the arch, but we got there. After a little experimentation and clear enough skies, we were able to accomplish our goal. Unfortunately, there is now a village with extensive light pollution directly southwest of the arch, exactly below where the core of the Milky Way aligned with the arch. 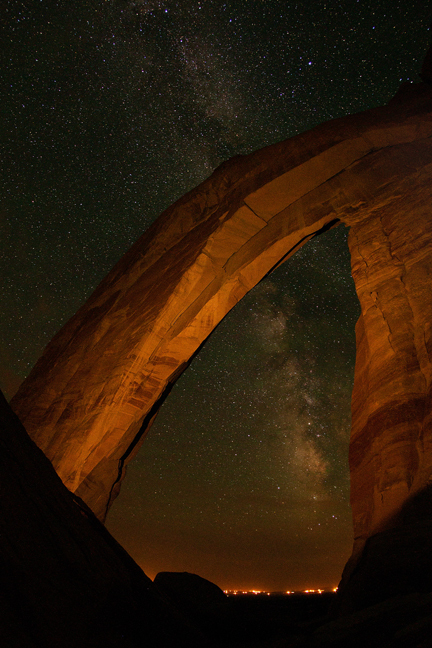 Even in the middle of the Navajo Nation, completely dark skies are challenging to find. We returned a day later for sunrise, but skies were still hazy.